Fruit purees are recommended for babies amid 6-8 months old to get them ready for solid food. You can buy purees from the store, but it’s better to give your baby homemade fruit purees which are much healthier and more costless. This article has some easy and affordable recipes for making purees to serve your baby. One of the preferred initial fruits for 6 months babies is apple sauce prepared from red or gala apples, making it delicious, mild and sweet. Apples are recommended for your babies as they contain vitamin C and fiber, which are essential components for the baby’s growth. Some studies also suggest the apples may protect babies from diseases, such as asthma. 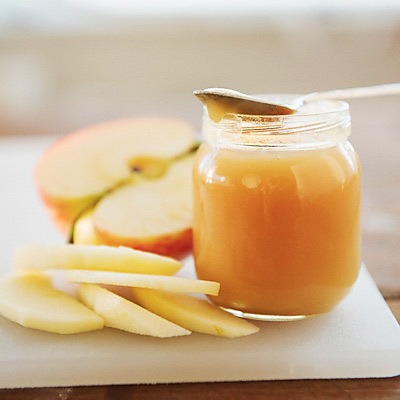 The versatility of the apples allows apple puree to be paired with other fruits, veggie, meat or poultry purees. Ingredients: 4 fresh apples which are approximately 2 pounds. How to make it: Clean and peel the apples. Then, slice the apple into quarters and steam it in a vegetable steamer for about 12 minutes or until very tender. Have the apples in a food processor until smooth. For babies new to solid foods, start with 2 tablespoons and increase gradually. Bananas are rich in potassium and they are very ideal fruits for 6 months babies. 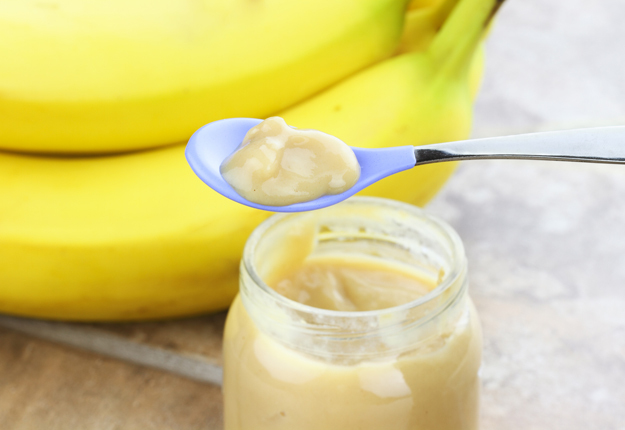 Banana puree is good for the young tummies of babies to appease them from stomach upset and combat diarrhea. The puree is sweet and creamy, and it can be used to balance other purees made from tart fruits like strawberries and blueberries. Ingredients: A ½ ripe banana, 1 tablespoon of water, formula or breast milk. How to make it: Wash and peel the ½ piece of ripened banana and keep the other unpeeled in a covered container. Use a fork to mash the banana as you add water, formula or breast milk until you reach the desired consistency. It is essential to serve the banana puree immediately. 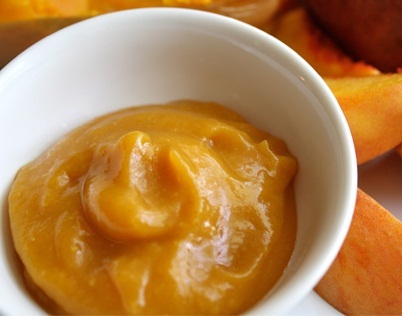 Peach puree is filled with potassium and beta-carotene which aid in the development process of babies. It can be served alone or as a mixture of either chicken or banana. You can also stir it into creamyGreek yoghurt to make it even more delicious for the baby. Ingredients: 4 ripe peaches (about 1.5 pounds in total). How to make it: You first need to wash, pit, peel and slice the peaches into halves. Steam the sliced peaches in a vegetable steamer for about 6 minutes or until tender. Process the tender peaches with a food processor until smooth. The riper the peaches, the more juicy and tasty it is. 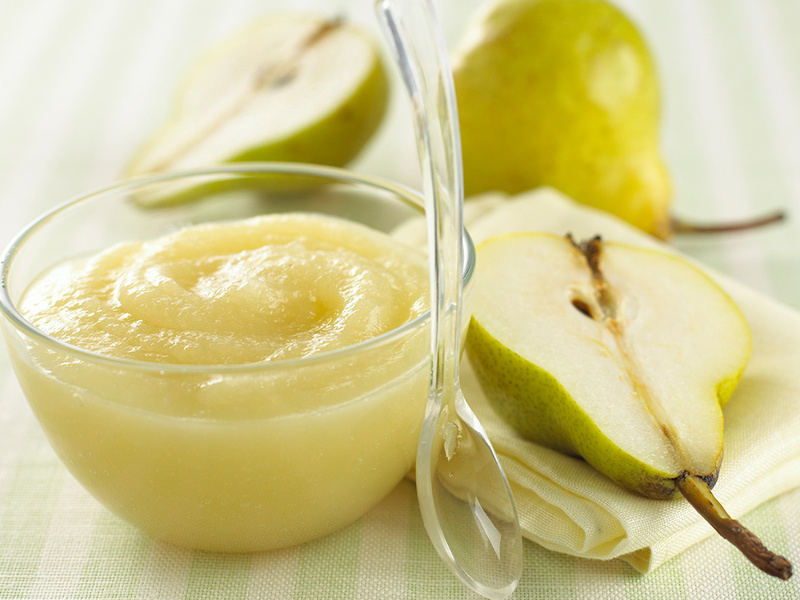 Pear puree is too sweet and delicious for any baby to resist. It’s rich in fiber and can be mixed with certain veggies, such as green beans to make them more appealing. How to make it: Wash and peel the pears. Cut the pears to remove the core and slice each half into equal slices and quarter each slice. Steam the slices in a vegetable steamer for about 8 minutes or until tender. For babies new to solid foods, start with 2 tablespoons and increase gradually as they are getting used to solid food. You need to ensure that the pear puree freezes well. 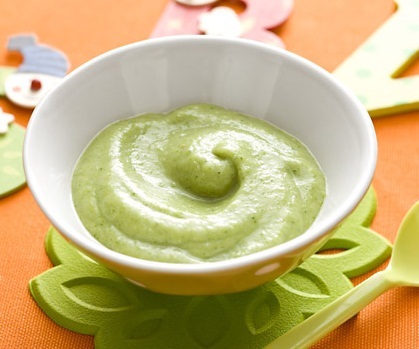 Avocado puree is packed with omega-3s fatty acids which help in the growth of your baby. It does not require cooking and is also delicious when mixed with other puree, like fresh banana puree. Ingredients: 1 avocado and 2 tablespoons of water, formula, or breast milk. How to make it: Wash and slice the avocado into two pieces. Scoop out the flesh by using a spoon from one half of the avocado, and reserve the other half with a pit in a plastic bag for later use. Mash the scooped flesh with a fork, adding 2 tablespoons of water, formula or breast milk until you reach the desired consistency. You need to ensure that avocado puree is served when fresh. 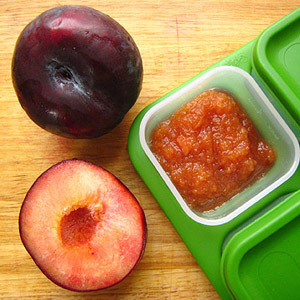 Plum puree is rich in fiber and acts as a natural protection against constipation. It has a combination of sweet and tart flavors, making it a favorite meal for your baby. It can be made with pitted prunes or fresh plums. Ingredients: 6 plums which are clean, peeled, halved and pitted. How to make it: Steam the plums in a vegetable steamer for about 7 minutes or until very tender. Then process the steamed plums in a food processor until smooth. For babies new to solids, start with 2 tablespoons and increase the quantity gradually. You need to ensure that the plum puree freezes well. Apricot puree is tangy and rich in beta-carotene. It can be mixed with sweet potatoes, bananas or apples when you start extending your baby’s menu. Ingredients: 1 pound of soft dried apricots and 300 ml water. How to make it: Steam the apricot with 300 ml water in a small saucepan over a medium heat for about 30 minutes or until very tender. Then process the steamed apricots in a food processor until smooth. It can be served alone or as a mixture with either orange, white grape or apple. You can serve it while it is warm or cold, and you can also stir it into creamyGreek yoghurt to make it even more delicious for the baby. 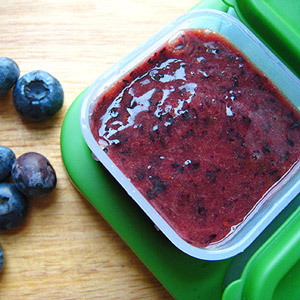 Blueberry puree is rich in antioxidant, which supports in the development of the baby. Depending on the berries you use, the puree can have a deep purple color which is either somewhat tart or very tart. The puree can be mixed with apple, pear, and banana. How to make it: Wash the blueberries to ensure they are clean. For under-ripe or frozen blueberries, steam them for 3 minutes. Then process steamed blueberries in a food processor until smooth. However, if the blueberries are ripened, skip the steaming and mash the blueberries with a potato masher.